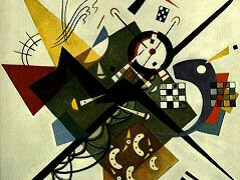 Russian-born Wassily Kandinsky pioneered abstract art in the late 19th and early 20th centuries. His unique perspective on the form and function of art emphasized the synthesis of the visual and the auditory. He heard sounds as color, and this unusual perception was a guiding force in the development of his artistic style. He believed the purpose of art to be the conveyance of the artist's unique inner vision, which required transcendence of the objective world. Born in Moscow in 1866, the artist did not seriously pursue his artistic career until the age of 30. He had studied law, economics and ethnography at the University of Moscow, becoming a professor of law upon graduation. It was during his time at the university that he reprised his childhood interest in art, and in particular, the symbolic nature of color and its spiritual implications. He experienced a sort of epiphany upon viewing a Monet exhibit in Moscow. At first put off by the artist's Impressionistic Haystacks paintings, Kandinsky found nevertheless that Monet's use of color impacted him in a significant way, taking on an almost mythic power. During this same period, the artist attended a performance of Wagner's opera, "Lohengrin," which had a similarly powerful effect on his sensibilities. It sparked a synesthetic experience in which the notes he heard became colors and visual images, a perception that would instruct his theories about art. After only three years of teaching, Kandinsky enrolled in a Munich art school to study with Anton Azbe, a Slovenian Realist whose forte was figure drawing. At Azbe's studio, Kandinsky worked beside fellow Russian Alexej von Jawlensky, a future Expressionist who acquainted his new friend with the city's avant-garde society. After two years of tutelage, Kandinsky took a year to hone his craft before entering the Munich Academy to study with Franz von Stuck, a demanding traditionalist who was the city's foremost painter at the time. The master's emphasis on Symbolism in his own work as well as his focus on the imagination proved inspirational to his students. Kandinsky and a few of his avant-garde colleagues founded an artists' group called Phalanx in 1901, a reaction to the restrictive status quo of the Munich art scene. In 1903, the artist painted his first milestone artwork, "Der Blaue Reiter" or The Blue Rider, an Impressionistic scene of a man in a blue cape astride a white horse. During this first decade of the 20th century, the artist developed a progressively innovative style that reflected the influences of such schools as Fauvism, Pointillism and Expressionism. His figures became less distinct, his compositions increasingly planar. In such 1908 pieces as "Munich-Schwabing with the Church of St. Ursula" and "Autumn Study Near Oberau," the interplay of color took precedence over conventional form. In 1909, Kandinsky was instrumental in founding Neue Kunstlervereinigung Munchen, or New Artists' Association of Munich, a group of radical artists whose avant-garde approach was far removed from the mainstream art of the era. The artist's budding abstract style began to blossom during this period with works that de-emphasized traditional boundaries such as form and line, focusing instead on communication of emotion through juxtaposition of color. 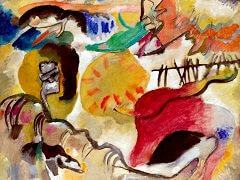 In 1910, Kandinsky completed an untitled watercolor that art experts consider to be his first truly abstract painting. Like his friend Swiss painter Paul Klee, Kandinsky was a talented musician and his abstract paintings are often described as 'painted music'. However, Kandinsky was adamant that this was not true. 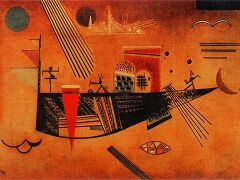 In a lecture he gave in Cologne in 1914, he insisted that all he wanted to do was 'paint good, necessary, living pictures'.Similar to music that has no concrete form but is a direct expression of the composer's perceptions, Kandinsky's abstract art sought to eliminate the intermediary, objective world and portray his inner vision directly on the canvas, expressed in terms of color and motion. He believed that abstract art could establish a line of communication directly from the artist's inner vision to the viewer's imagination and elicit a specific emotional response. In 1911, the New Artists of Munich rejected one of Kandinsky's entries for their exhibit. He responded by establishing a rival exhibition for The Blue Riders, a new group he formed along with German painter Franz Marc and such Expressionists as Jawlensky, Auguste Mack and Gabriele Munter. 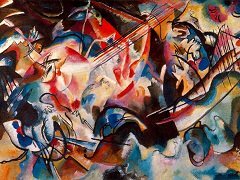 The group sponsored three exhibitions and published "The Blue Rider Anthology," but dissolved in 1914 with the advent of World War I.
Kandinsky's first book exploring abstract art theory, "Concerning the Spiritual in Art," was published in 1910. In it, he explained the method behind what many critics of the time considered to be his madness: his innovative approach to visual art. In the treatise, Kandinsky seeks to vanquish what he terms the nightmare of materialism in favor of enlightened spiritualism in art, and makes a case for the similarity of music and visual art in terms of expression. The artist used musical terms such as "improvisation" and "composition" in the titles of his pre-war paintings, emphasizing the link between the two art forms. For example, he entitled a 1912 painting "Improvisation 27, Garden of Love II." The critical response of the mainstream art community to Kandinsky's first abstract efforts was uncharitable at best, and the artist understood that to gain acceptance for his work, he could not abruptly sever all connections to tradition. As a result, some of the pieces he produced during the second decade of the 20th century retained a few recognizable objects. For example, Winter Landscape from 1909 contains the outline of a house and triangular trees while Sketch 160A from 1912 contains a stylized image of a troika pulled by a trio of horses, which are represented by three lines and three indistinct heads. In 2014, Kandinsky returned to Moscow to wait out the war. While there, he joined the city's Academy of Fine Arts and founded The Institute of Artistic Culture. He also directed the Moscow Museum for Pictorial Culture. In 1921, he established the Russian Academy of Artistic Sciences. In his own art, he was drawing ever closer to complete abstraction. By the time he left Moscow in 1921, his paintings, such as "White Line" and "Red Spot," contained no recognizable objects. 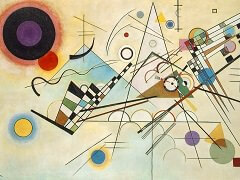 In 1922, Kandinsky began teaching at the Bauhaus school of applied art and architecture in Weimar, Germany. Bauhaus focused on the unification of the arts for practical applications. When the school moved to Dessau in 1925, Kandinsky followed. He published his second treatise on art theory the following year, entitled "Point to Line to Art." In the early 1930s, Germany was completely under control by the Nazi Party, and Hitler was able to gather as much as 16,000 avant-garde artworks that were originally in display in the national museums of Germany. He also ordered to ship about 650 artworks to Munich in preparation for his art exhibition called the Degenerate Art. Works of many contemporary artists such as Wassily Kandinsky, Marc Chagall, Paul Klee, and Piet Mondrian are included in the exhibition. Soon Nazi regime closed down the Bauhaus school, and Kandinsky moved to Paris. Among his paintings of this period was "Development in Brown," a somber collage of rectangles and circles surrounding a colorful banner of triangles. Historians draw a connection between the painting and the brown-uniformed Nazi soldiers who had been appearing throughout Germany in growing numbers. In Paris, the artist incorporated the sense of order that pervaded the Bauhaus into his work with geometric figures and more noticeable compositional balance. His painting Striped from 1934 is a combination of squares and spheres with dissecting lines. Horizontalee from 1939 is a black and color checkerboard with distinct geometric or free-form symbols in each square. Two of his final masterworks, Composition IX from 1936 and Composition X from 1939, bring together the various elements of Kandinsky's vision and style in entirely fresh ways. "Composition IX" features a background of brightly colored diagonal swaths with several animated symbols floating through the scene. "Composition X" features brightly hued shapes on a dark background. The exceptional vibrancy of the various symbols communicates a joie de vivre absent from his early works such as Composition VI and Yellow-Red-Blue. 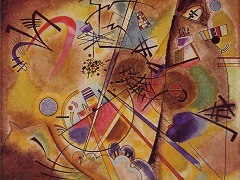 Just like Shakespeare on literature, and Freud on psychology, Wassily Kandinsky's impact on abstract art is tremendous. Kandinsky's artistic output in terms of volume and consistent quality is phenomenal by any standards and matched by very few artists in any generation. Althought like many artists his paintings show an apparent dissimilarity between the early and mature works. 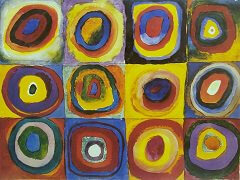 Kandinsky showed one consistent theme throughout the 'inner necessity' to paint. 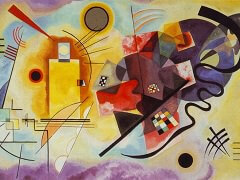 As his fellow artist Diego Rivera has suggested, 'Kandinsky's art is not a reflection of life, it is life itself'. 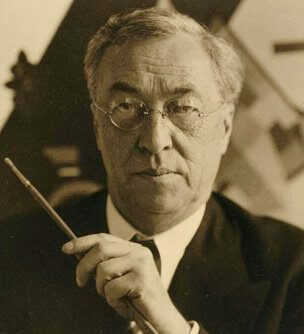 The influence of Wassily Kandinsky art theory and Wassily Kankinsky paintings during the artist's lifetime was considerable, both by virtue of his collaboration with his colleagues in the various groups he founded and by the treatises he published. His writings laid the groundwork for 20th-century movements like Abstract Expressionism. Later artists such as Jackson Pollock would inform their own unique vision with the tincture of Kandinsky's theories. Mark Rothko and his contemporaries in the Color Field school reprised Kandinsky's emphasis on the emotional power of color, and members of the Neo-Expressionist movement in the 1980s were subject to Kandinsky's influence as well. Perhaps more than any other master of his era, Wassily Kandinsky forever changed the way both artists and the world at large would approach - and appreciate - visual art.